Whether it’s in the offices and laboratories in Davis, health clinics and operating rooms in Sacramento, research stations on the California coast, or even on dairy farms in Rwanda and beyond — UC Davis faculty and staff are making and sharing discoveries that change the world. UC Davis and UC Davis Health are unlike any other institution. The academic campus is uniquely located in in Northern California in the city of Davis, and UC Davis Health is headquartered in Sacramento, along with the state capital. Together, they make up the largest campus within the University of California system. At UC Davis, we work hard to build a community of changemakers and problem solvers. We are committed to creating a place where people from all walks of life can learn, grow and discover together. Our community of faculty and staff are dispersed throughout the state, nation and world with a mission to advance the human condition through improving the quality of life for all. 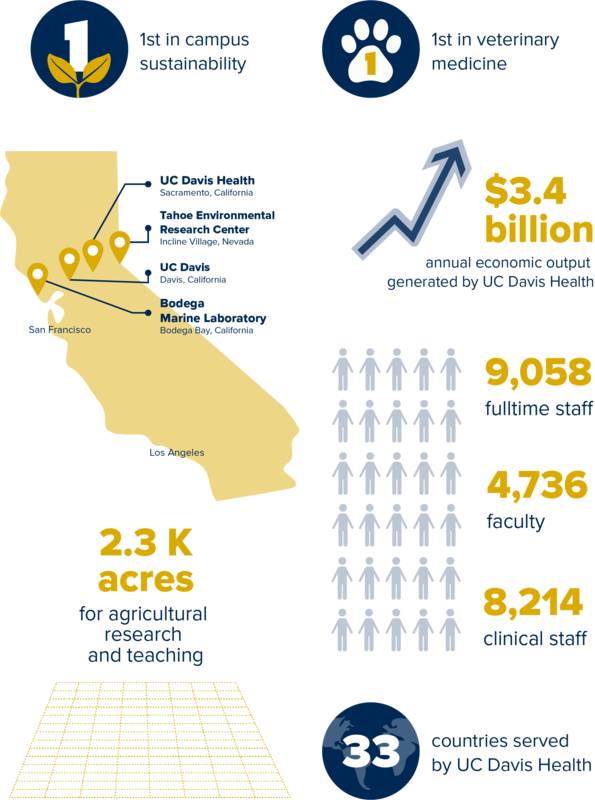 Located in Sacramento, UC Davis Health is a major driver of economic prosperity in the region and Northern California, generating more than $3.4 billion in annual economic output and more than 20,000 jobs. The academic health system includes one of the country’s best medical schools, a nationally ranked 627-bed acute-care teaching hospital, and a 1,000-member physicians’ practice group. UC Davis Health is a hub of innovation that encompasses the UC Davis Medical Center, UC Davis School of Medicine, The Betty Irene Moore School of Nursing and UC Davis Medical Group.